What do Stephen Hawking, the Raëlian UFO & Intelligent Design cult, and SETI have in common? Bear with us, and all will be revealed. Hawking may be right about that. Or wrong. But in the opinion of the Raelians, he’s totally wrong. We like the Raelians, a sect based entirely on intelligent design (ID). 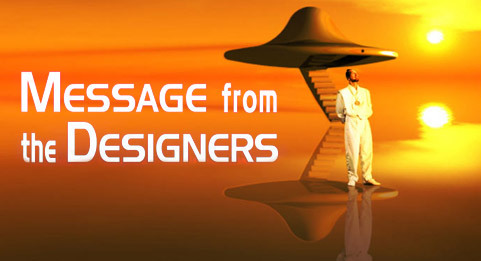 See their Message from the Designers. We like them because they help us point out that in addition to the Christian denominations that follow a literal reading of Genesis, there are people all over the world, of many faiths, with a deeply-held belief in creationism, creation-science, and Intelligent Design. Among those who are fervent believers in creationism are many — perhaps most — Muslims. See: Why Muslims Should Support Intelligent Design, By Mustafa Akyol. It’s not only Muslims. There are also the Hare Krishnas. Their website has this article: The Intelligent Designer. And let’s not forget the Unification Church, founded by Rev. Sun Myung Moon. One of Moon’s followers, Jonathan Wells, is a leading intellectual in the ID movement and a Senior Fellow at the Discovery Institute. See The Genius of Jonathan Wells. Finally, there is Hindu Creationism, Just Like Our Own. But the Raelians, who believe in ID without otherwise being involved in any particular religion, are an excellent vehicle to illustrate that our opposition to creationism (and ID) is not at all motivated by hostility to any sect. Our position is simplicity itself — regardless of religion or non-religion, creationism is silly science. Period. The universe, he [Hawking] points out, has 100 billion galaxies, each containing hundreds of millions of stars. In such a big place, Earth is unlikely to be the only planet where life has “evolved”. Rael commented on these pessimistic ruminations: “With these views, Hawking demonstrates that he’s not only physically handicapped but mentally handicapped by the degenerative disease of ‘evolutionism’ or ‘Darwinism. Rael’s ravings may be far more attractive to a certain kind of mentality than the bland, pseudo-scientific pretensions of the Discoveroids. There’s more to the article, so click over there and read it all if you like. What do we learn from this? We learn that ID — far from being a scientific theory — is some kind of symptom. Of what, we don’t know, but we recognize it when we see it. It’s a symptom of a deep-seated desire for humanity to be the ultimate purpose of the universe. Same thing that drove geocentrism. Science tells us the nuts and bolts of how we function and how we got here, and it can made predictions about our future based on available data. Higher purpose is the bailiwick of philosophy and theology, and attempts to meld it with science are doomed to fail. Infinity is one of the main concepts of the Raelian philosophy, very often rejected by the Scientific community for it is difficult to prove infinity. This is so utterly, profoundly, and completely idiotic — every scientist who uses calculus is subsumed by infinity and the infinitesimal, bathed in it, swaddled in it. So much nonsense; so little time.